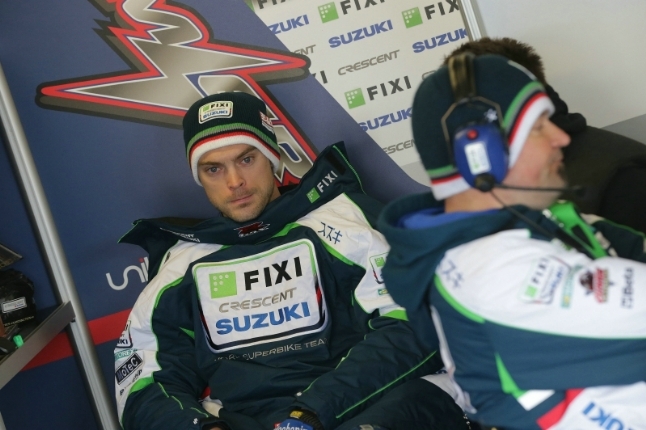 Camier: "It was absolutely horrible out there today"
Fixi Crescent Suzuki rider Leon Camier finished 6th in the first qualifying session at Donington Park this afternoon. The Englishman, who is still recovering from the knee injury he suffered in Aragón a month ago, sits just four tenths off second place. QP1 was the first session today for most of the World Superbike riders as many opted not to leave their pit boxes for this morning’s FP1 due to the adverse weather conditions. Camier went out towards the end of the session to test some electronic settings but swiftly returned to the box after just two laps.